The sun is out today! 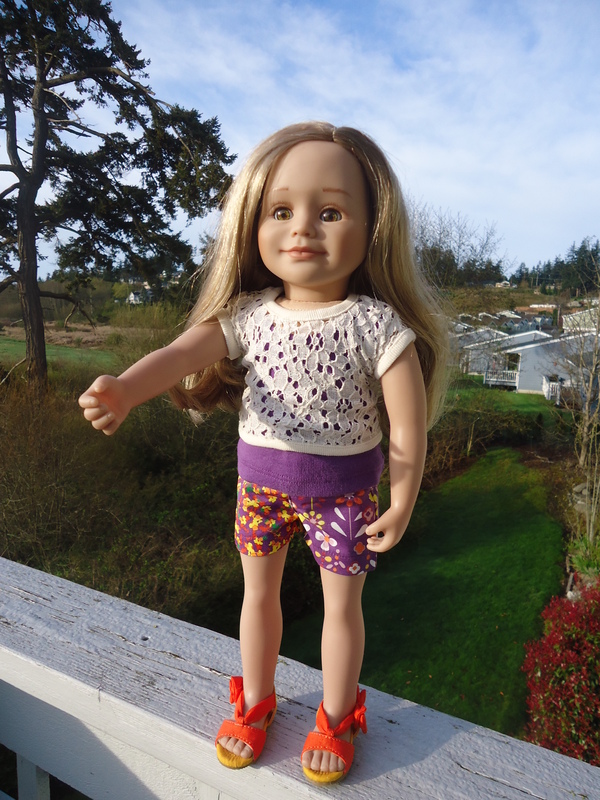 Leonie’s wearing shorts, and the blue sky behind her looks fake! The outfit is named Flower Power, and I totally want this look in my size. The shoes are amazing! Only 28 days left until Maui! 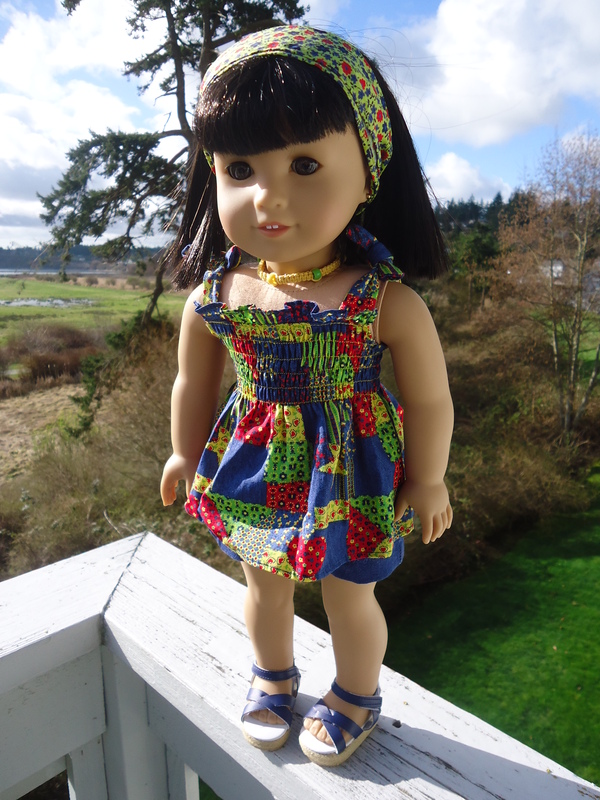 Here’s Addy in Ivy’s Rainbow Romper. Gotta go. Bye. 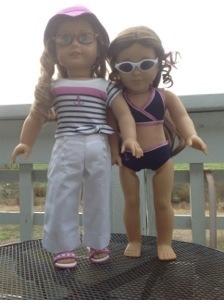 Nicki and Marie-Grace are wearing one of my favorite American girl swim outfits ever. It is a 2-in-1 outfit, and it came with everything they’re wearing, including the hat and glasses. Patience is finally here! She’s been in town for 7 days, but the post office is dumb. She came last Tuesday. The letter carrier left a card at my door. I read the card, decided to sign up online for redelivery. They said I met the deadline for next-day redelivery. I filled out the card as instructed, taped it to my door, and went to work. Got home from work and there was a note in my mailbox that they couldn’t leave the package because I needed to fill out the card. I wrote on that note that I did fill out the card and had taped it to my door. Went to my mom’s house for 3 days, expected Patience to be at my doorstep when I got home on Saturday. She was not. Both the note and the card were gone. Online tracking still said unable to deliver. She was finally on my doorstep Monday night after work. Thanks for allowing me my post office rant. Now on to Patience! She’s adorable. Her eyes move on their own. They’re weighted, so they only move when you move her. They don’t move when she’s sitting still–that would be really creepy. They’re a little creepy as they are, but she gets some adorable peeking-around-the corner expressions, which is why I fell in love with her. This is Garden Party Patience, ready to greet spring. 32 days ’til Maui! Today Jenna is wearing a Leonie outfit called Landmark Lore. 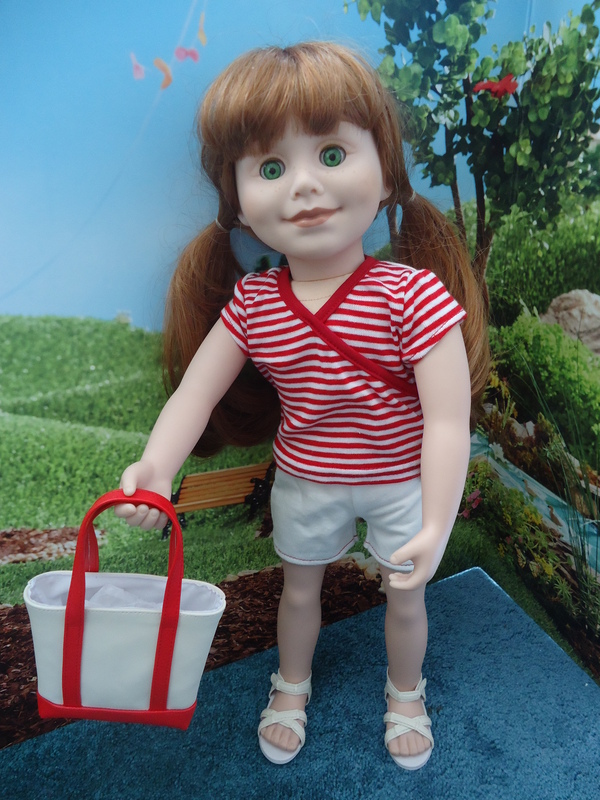 The outfit comes with a t-shirt, shorts, sandals and a bag–everything she needs for a day of sightseeing. In fact, the journal pages that accompany the outfit talk about sightseeing landmarks around Quebec. Jenna’s ready to go–33 days ’til Hawaii! 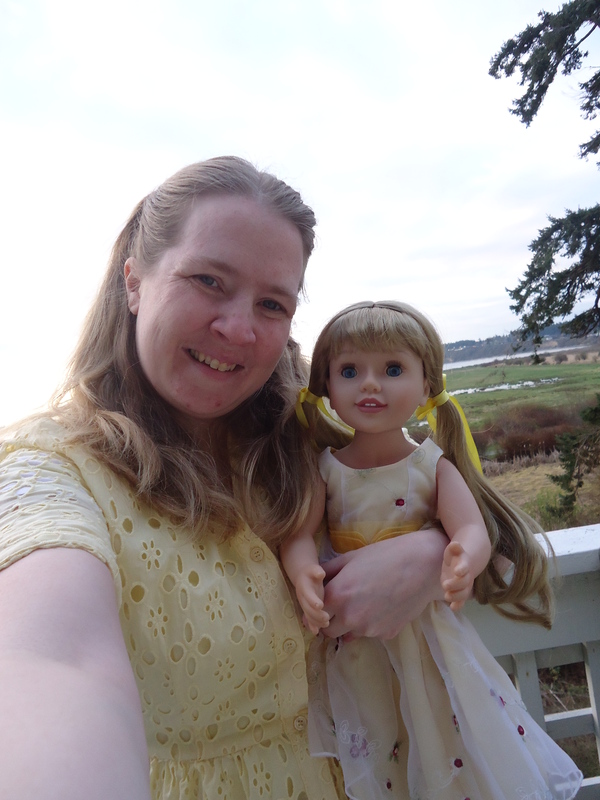 Today I am wearing yellow. 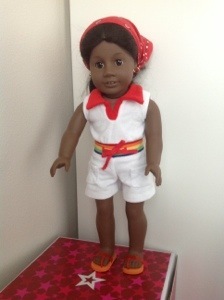 Just like Sheila (Australian Girl doll). Here’s a not-too-bad selfie.